The UK government has outlined a number of new measures in an effort to clamp down on the illegal streaming of copyrighted content. After calling for views about illicit IPTV streaming devices, the Intellectual Property Office published its response yesterday stating that while existing laws are working, the government will also push ahead with a range of steps to tackle infringement. These include considering administrative site blocking – looking at the evidence for doing this, the potential impact it could have, and identifying how it could be introduced – as an alternative to today’s requirement for High Court injunctions against specific sites. The government also said it is working to further develop its understanding of how apps and a new generation of smart TVs might affect infringement; is researching consumer attitudes about the use of illicit streaming devices in order to come up with more effective strategies to reduce their levels of use; and will deliver up-to-date training to trading standards officers via existing ‘IP in Practice’ courses. “Illegal streaming damages our creative industries. We have always been clear that media streaming devices used to access ‘paid for’ material for free are illegal. Recent prosecutions have shown that if caught, sellers of boxes adapted in this way face fines and a prison sentence,” said minister for intellectual property, Sam Gyimah. The government highlighted that the use of illicit streaming devices – like Android TV or Kodi boxes that have been altered with apps or add-ons that make it possible to watch paid content for free – damages the UK’s £92 billion creative industries. However, it said that a number of recent prosecutions show existing laws are working. This summer, for example, the owner of a pirate football streaming service was jailed for five years in Newcastle Crown Court, after pleading guilty to conspiracy to defraud and dishonestly obtaining services for another, contrary to the Fraud Act. Kieron Sharp, chief executive of UK intellectual property protection organisation, FACT, said: “TV boxes and sticks that allow consumers to illegally stream TV, films and sport not only have a huge effect on the content owners and broadcasters but the thousands of people working tirelessly behind the scenes to put this content on our screens. 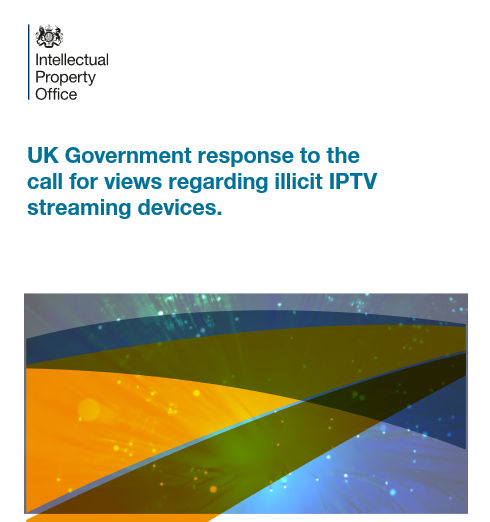 The full ‘UK Government response to the call for views regarding illicit IPTV streaming devices’ paper can be accessed here.